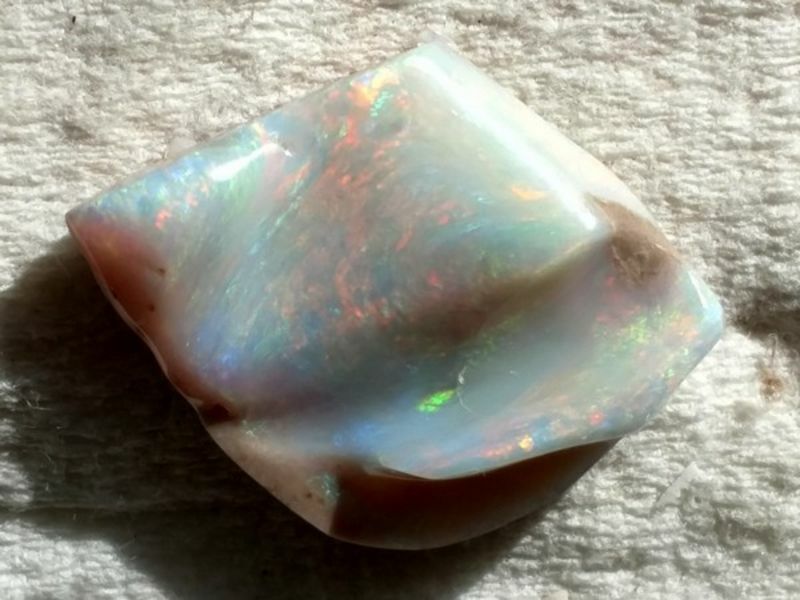 So, this is my first "carved" opal. I was basically just chasing color bars so it's as free form as you get. It's not finished yet. Still need to do a final shaping on it. The sun has not been very cooperative lately, so I jumped on an opening in the clouds to get these pictures a few days ago. Sorry they're cruddy pictures and the shadows from the sun in them. I'm looking for some guidance on whether or not to try to bring the color up more. It's down there and came up in a few spots, but I chickened out and stopped where i was and just polished what I had. You can still see the white potch on top of the color in certain areas. gemfeller opalpyrexia what do you think? Anyone else that cuts opal, feel free to chime in. Looks great to me (particularly the last photo's orientation). The one edge (bottom-right in the last pic) looks like it could be evened out a bit, though once set it probably won't matter. Yep, that part will get evened out and the little ledge above it may go away entirely. Still trying to decide on that. The little ledge has some awesome green/blue fire in it when the sun hits it right, but it's really directional. There's also a sand line too deep to get rid of right where that ledge meets the "hump". That is looking so very cool! Generally I always keep "digging" if there's a prize to be had and it doesn't increase fragility or reduce value though carat loss. But your piece being a carving is more than just a gemstone. If removing the potch doesn't detract from the very pleasing shape you have, I'd say go for it. I've tried carving only once. I'd be interested in seeing your setup if you wouldn't mind posting a photo. hummingbirdstones, I don't have a strong opinion on your carving. I'd have to see it and study it in 3-D before deciding how to proceed. 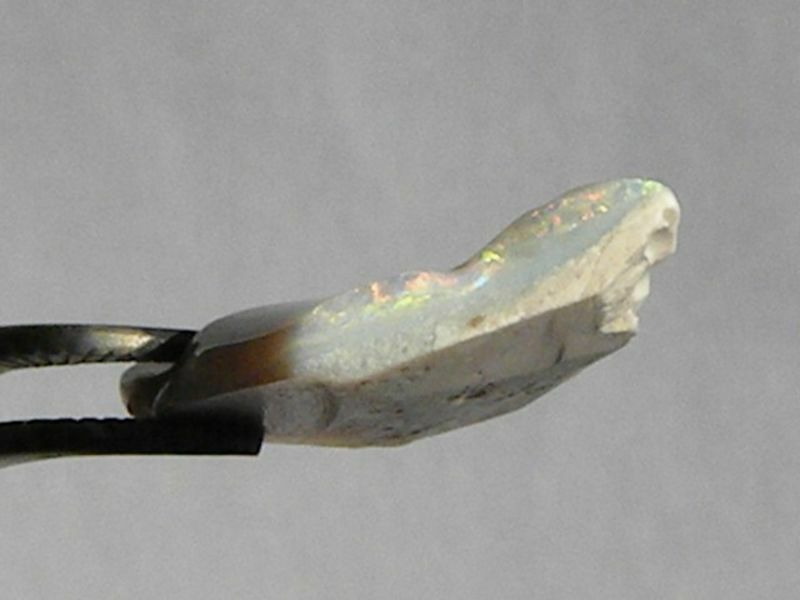 I tend to be a bit conservative in my opal cutting, perhaps too much so. I figure you can always remove more material but you can't replace what you've already cut away. 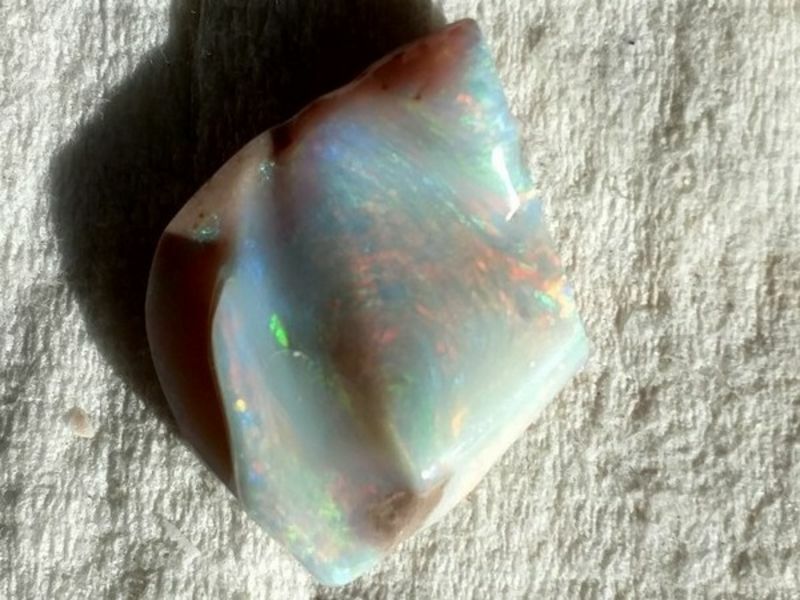 It seems to be a very nice light opal with an interesting color pattern. To bad about the directionality but those stones often make very nice pendants. Keep us posted on what you do with it. hummingbirdstones , Yeah -- chaff pattern. I knew it was a named pattern. I was grasping for it but it didn't pop into my head. I'm also trying to find space to set up a fixed carving arbor. I have all the equipment but no room. I'm sure this has occurred to you but on the off chance it hasn't, I find it easier to manipulate the stone using a Foredom when it's dopped. I'm working on a piece of yellow common opal from Idaho as a practice project but can't seem to get all the scratches out of it to save my life. Eliminating the scratches when transitioning from metal burs to sanding/polishing burs remains a problem for me. gemfeller I actually didn't even think about dopping the stone first. DUH! Little bugger is not flat on the backside. Bulges out in the middle with the sides going up. It was a pain to hang on to. I do believe I will dop it for the next round of sanding, though. Thanks for that. Those diamond smoothing discs really helped with getting the scratches out. I used them after the diamond burs to smooth all the roughness and scratches out. I only have the 325, 600 and 1200 grit discs. I believe I may invest in the smaller sized holders and the whole array of discs from 220 through 3000. They worked very well for me. It's been a long while sine I did any carving and I'm rusty. Also, my back hurts like blazes after a hunched-over session concentrating on carving small objects. I've just started again after a long layoff and am trying to remember all the stuff I studied when I was heavily into it. Wow, gemfeller, that is going to be an absolute stunner! Some of the best material came out of Cocooran. Love it! I just remembered that I also used some of that smoothing disc stuff from scraps that Vince had left over from one he cut down to a 6" disc size in a pair of locking hemostats that I bent around the business end and used that manually to get into the grooves. Here they are. They were still laying on my bench. I'm going to buy the large discs, too instead of those small ones and then have Vince cut me a bunch of different size discs to fit the holders. He has these leather punches in all different sizes and he cut me some out of that scrap because I didn't have any 325's left. That will be way more cost efficient. Let me know if you want some. Then I can use the scraps in the hemostats to get at those little places. Tiny places will have to be bamboo sticks and paste, I guess. Wow, gemfeller , that is going to be an absolute stunner! Some of the best material came out of Cocooran. Love it! Haha! I just logged in to suggest using a 1/2" punch on the larger discs to save money —— but you're already on that! I've never given the Hi-Tech flexible discs a second glance, but your carving thread here has changed my mind. I'm going to get some while their Tucson discount code is still active. 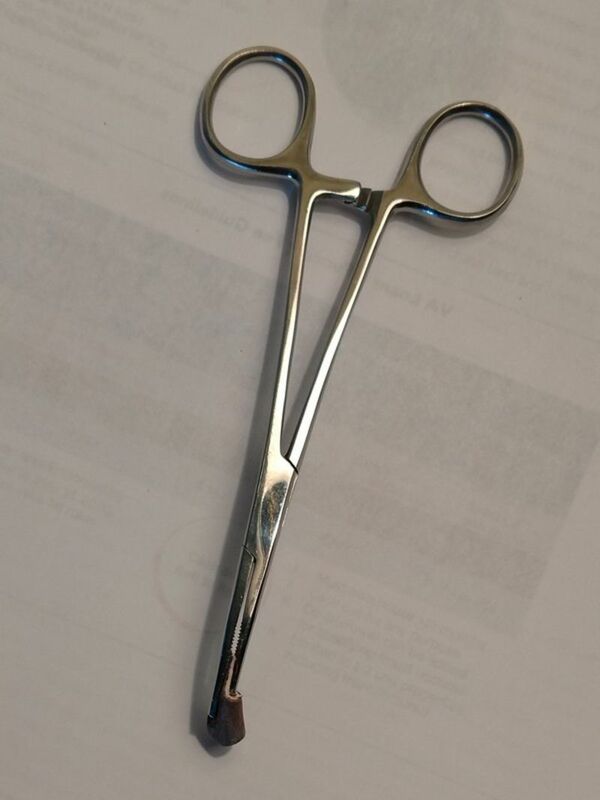 The hemostat is clever, too. Credit where credit is due, opalpyrexia. Vince actually came up with the scrap and hemostat idea. He's real good at that. Hello Robin. I haven't been on for a long time and something told me I should come here. If you have that much power handle it very carefully. I cut a bunch of Welo opal a few years ago and it was nothing like fire agate where the tiny change in depth can ruin everything. The flash in my stones was all the way through no matter the quantity or quality of the flash. The thing that changed the most was the amount of haze but even that wasn't enough to spend a lot of time trying to hit a more clear part.I will admit that most of the stones were quite small but the one larger one pretty much followed the same rules. I worked all of them with just files and hardware store sand paper because I did not have much experience with the rotary tool. The only way I could work such small stones was with bamboo skewers and super glue for dop sticks. I am not sure if I got those photos moved over to here but I will check and post them later. If all else fails I still have the larger stone in a ring and some of the smaller stones loose. Hey there Wampidy. I remember your opals, and that they turned out really good. That wasn't too long after Robin and I visited with all of y'all down at Tony's cookout on our first trip to Q. 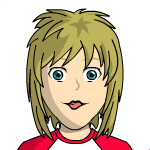 Good to see you on here - it has been a while... .
Hi Jim! It's so good to see you on here. It has been way too long since you've graced us with your presence! 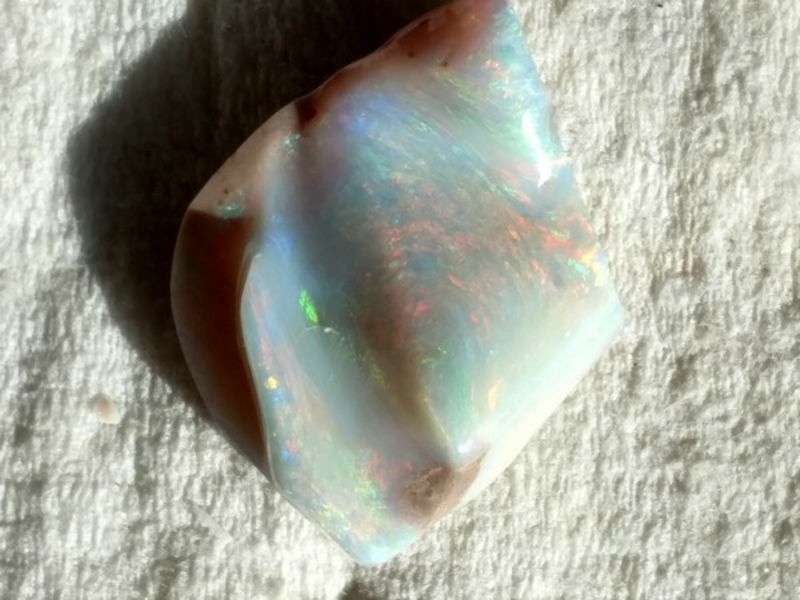 The Aussie opals are different from the Welos because most of them do have color bars that don't go all the way through the stone. Here's the side view showing the color bar. It's about 1/8" thick. The stone itself is about 1-1/4" x 7/8". I still think I'm going to try and make the color come up a bit more, but not too much. 1/8" isn't much to play with. I think the hoodoo works both ways. Earlier yesterday I had been looking through posts in the carving area and saw your old post on those Welos. Was thinking about how I hadn't seen you around in a while and wondering how you were doing. Hope everything is good and you pop in every once in a while to say hi. I sure do miss your wit and sense of humor! Good job! 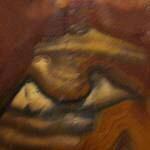 I don' t mind the reflections because they show the dimensionality of the carving. It looks like you found the suspected color plane. It should make a really great pendant. Now I've got to get to work! 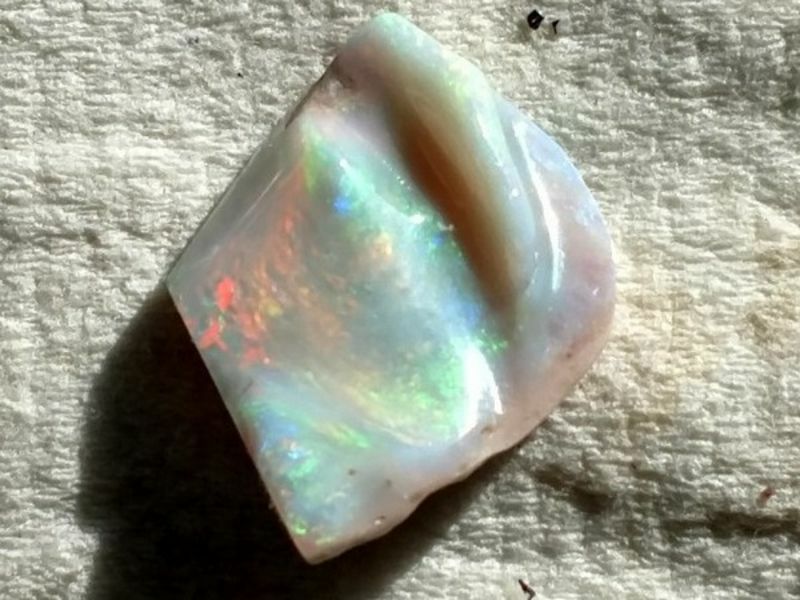 I have house guests until the middle of the week but plan to do some opal carving ASAP. Thanks, gemfeller! It looks much better now, I think. Don't forget to show yours when you're finished. Hi All. Beautiful job on that Robin! 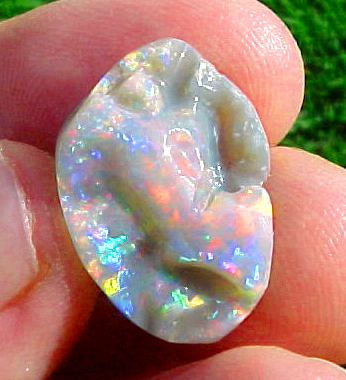 I've had "learn how to carve opals" on my todo list for about a year now, and I'm itching to get started now! Great to hear people's tips and tricks and what works for them. Thanks for the info/ideas about the discs, and the hemostat idea. One holder idea might be to make a base from Jet Set (or other hard plastic molding material), like . . . oh what's his name . . .on Youtube . . . argh . . . uses to push bezels. Hebrew sounding name. Know who I'm talking about? I wonder if the new harder rubber Eve AdvantEdge silicone sanding points would work on opal - they're a nice shape, about the size of a QTIP head. In the picture they look big like the old ones, but they're new(er) and smaller and supposedly more durable rubber. 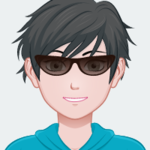 Soham Harrison - is that the guy you're thinking of? 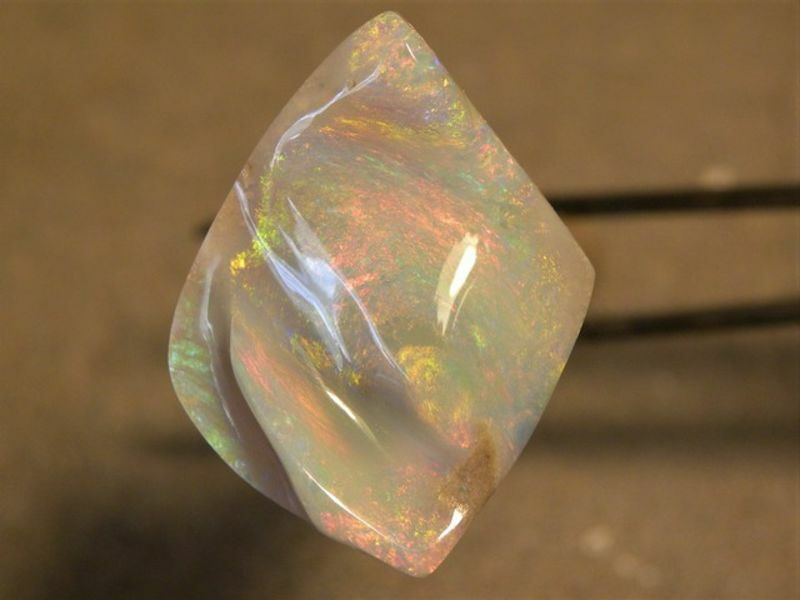 Carving opal wasn't as difficult as I anticipated because I was just chasing the color bars. I just used what I had on hand and it seemed to work ok. I dopped it up for the second round and that worked pretty good, too. I'm pretty sure I'll never be able to carve a figure. I just can't "see" a figure in the stone like some of the talented folks here can. I'm good with freeform. I haven't tried the AdvantEdge points, but I need to get some for metal, so I will try it and see. I was also considering getting some of those Diaflex and Diathin wheels. I think Don said he uses them on fire agate and that's one of my next challenges. If they work on fire agate, they'll work on opal for sure. The only thing I don't like is that you can't use them with water, so there's dust flying everywhere. Definitely need to use a respirator with those. You should really give it a go. If I can do it, you can.